Patrick McHenry-Kroetch (left) play the lead role of Tevye in the Civic's Fiddler on the Roof. The Spokane Civic Theatre is bottle-dancing into its 68th season with Fiddler on the Roof, one of the longest-running shows in Broadway history. The musical was adapted from the short stories of Sholem Aleichem, who even during his lifetime was often dubbed "the Jewish Mark Twain" — so often, in fact, that when the two met in 1906, Twain drolly introduced himself as "the American Sholem Aleichem." 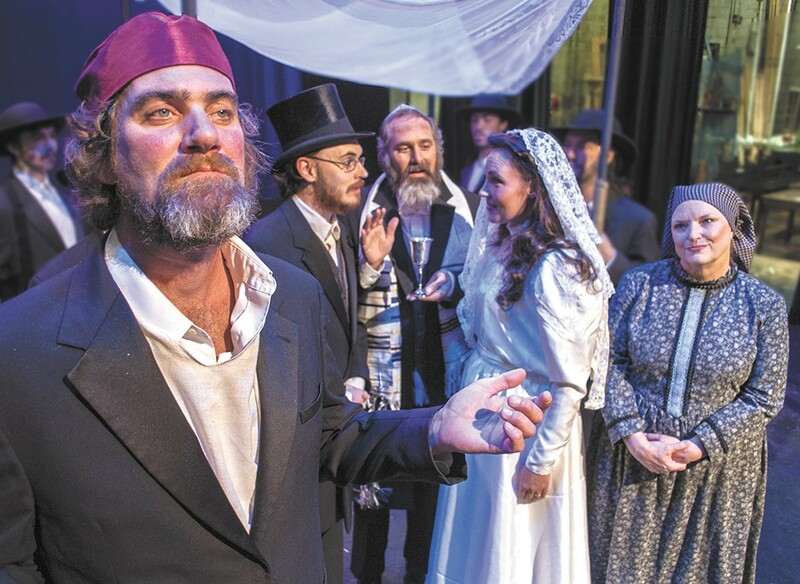 Although the story of Fiddler is specific to a particular time, place and people, something that worried some financial backers of the original 1964 Broadway production, there's a time-tested universality to its themes of family and tradition. Songs like "Matchmaker, Matchmaker" and "If I Were a Rich Man" have since transcended the show. Troy Nickerson and Heather McHenry-Kroetch are co-directing this production of Fiddler. Generally speaking, a director serves as a unifying force, which can threaten to complicate things when the job is divvied up. But the pair jointly directed Little Shop of Horrors at Ignite! last season with success, and McHenry-Kroetch says that after years of observing Nickerson's work from both sides of the curtain, she's uniquely attuned to his creative vision. "Troy and I are really good friends. We've known each other a long time, and for me, I know what he's going to want," she says. "We're good at communicating with each other about what we want the vision to be. He'll go stage a scene that I don't see at all, but when I see it, I know what he wanted, so I can clean it up with the actors and keep moving in the direction that we want to go. And the reverse is true for him." When it comes to Fiddler, the pair aims to continue the primacy of character and story that has been the hallmark of Nickerson's musical productions in recent years. The sets are to the drama what a frame is to an oil painting. "Our set's really very simple and really very cool. It's very representational. There are no full-on interiors," says Nickerson. "There's the outline of houses, and there's going to be our own stamp on it. You'll definitely see a different artistic take on some of the scenes." Much like Gypsy, the Nickerson-helmed finale to the Civic's previous season, they'll be paying close attention to the family dynamic at the heart of this musical, in which patriarch Tevye (played by McHenry-Kroetch's husband, Patrick) sees his daughters marry and the traditional shtetl household break apart. "It's very interesting to direct a show that's been done so many times," says McHenry-Kroetch. "I'm sure people have done productions where they're focused more on the relationships, but I'm finding lots of places to explore. There's some staging and also some real relationships" in this production, she says, "that are interesting in a way they haven't always been." Which isn't to suggest that she and Nickerson have fiddled greatly with Fiddler. Many of the musical's points are fixed, such as the famous bottle dance. In this classic scene, a group of cast members spin, crouch and kick with glass bottles perched precariously on their heads. "That's Jillian [Kehne], her choreography," she says. "It's a cool dance, and kind of iconic for this show. This isn't scaled back in terms of production value."